One of the biggest challenges for Christians who have grown up in the church and have been raised on Bible stories from infancy is to hear them in the way the original audience did. Many Bible accounts are so familiar to us, that we never really stop to think them through. Jesus’ parable of The Good Samaritan is a case in point. The term “Good Samaritan” has found its way into the English language as a way to refer to someone who helps strangers without being asked and with no desire for reward. We might come a little closer to the mark if we think of a “Good Samaritan” as someone who sees everyone as their neighbour. But, even then, we have scarcely begun to understand this parable and its radical message. So, what was Jesus’ point in this parable and how does he want us to live in response to it? In order to understand this parable (Luke 10:25-37), we need to understand the context in which Jesus told it. The parable was prompted by two questions asked of Jesus by an expert in Jewish law. The first was aimed at testing Jesus’ orthodoxy – “What must I do to inherit eternal life?” Jesus, always less concerned with winning the argument and more concerned with winning the heart, turned the question back on him “You’re the expert in the law, what do you think?” In response, the lawyer, to his credit, gets right to the heart of the matter by going to the two greatest commandments “Love the Lord with all your soul and with all your strength and with all your mind” and “Love your neighbour as yourself.” Jesus’ response is straightforward, “You’re right. Do that and you will live.” Jesus is not avoiding the lawyer’s question. The lawyer has asked for a way to earn entry into eternal life and Jesus has given it to him “All you need to do is love God wholeheartedly and perfectly and love your neighbour as much as you love yourself.” No problem! It is this second question which prompts Jesus to tell the parable of the Good Samaritan. The story is deceptively simple. A man was travelling from Jerusalem to Jericho – a dangerous road notorious for the thieves who would waylay unsuspecting people travelling alone. Sure enough, this traveller is robbed, stripped of his clothes and left for dead. We do not know whether this man was a Jew or not and neither can those who come after him tell from the bloodied form lying on the road. That is part of Jesus’ point – the man is a nobody with no discernible ties to anyone. Sometime after, first a priest and then a Levite (we might say a pastor and a deacon) pass. It seems that these men apply the lawyer’s “who is my neighbour?” test and, finding the man wanting, continue on their way. It is worth pausing at this point in the parable because this is an easy trap for us to fall into. It is easy to come up with lots of plausible reasons for not stepping outside of our comfort zone to help people: “I don’t know them from a bar of soap. They could take me for a ride.” “They knew the risks, they should have been more careful.” “Aren’t we supposed to do good to fellow believers first? There must be a needy believer somewhere ….” “They look a bit devious and shady to me, better to ‘bless them and pass them by.’” “Someone like that could be a bad influence on my children. It’d be better for someone else to help them.” “I wouldn’t even know where to start with someone like that. Better give them a miss.” “They probably hate Christians anyway ….” Like these religious leaders (those in this lawyer’s circle of friends), we often look for ways not to help rather than ways to engage. Like many of Jesus’ parables, the story takes a surprising turn at this point. You can almost hear him respond “But that’s impossible! Who can love as recklessly, indiscriminately and sacrificially as that? Jesus, you have just made the law impossible to keep!” And that really is Jesus’ point. God’s law is impossible to keep. There is nothing we can do to inherit eternal life. No one can meet God’s perfect standard. No one can love him with all their heart and soul or love their neighbour as they love themselves. We are the man lying on the road, caked in our own blood, hopeless and helpless – desperately in need of a good Samaritan who will pour himself out for our sake. 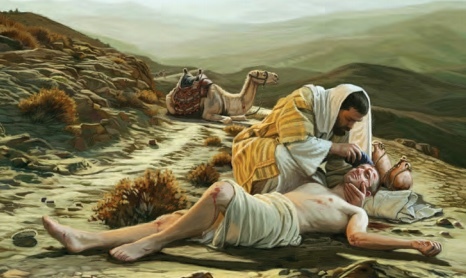 Jesus is the good Samaritan – hated by those he came to save (John 8:48; Romans 5:10) – who laid down his life for us. There is nothing we can do to inherit eternal life. The only way to obtain it is as a free gift of grace purchased in Jesus’ blood. Loving God and loving our neighbour are a response to the way that God has first loved us. They are not a way to earn eternal life but a fruit of having received it. Only those who have experienced God’s grace in Jesus can begin to show that grace to others. That is what it means for us to be good Samaritans – to be agents of God’s grace to those he places on our paths – whoever they are (no excuses!). Those who have received God’s grace become channels through whom that grace flows to others. His grace moves us to “take pity” on others, made in his image, whoever they may be and to give ourselves for them. Rev. Andre Holtslag’s article has some great thoughts on where to start but let me leave you with some questions. Who has God placed on your path that you have disqualified as a neighbour? Another way to say this might be, “Who has God placed on your path that you find it hard / impossible to love?” How might you begin to be an instrument of God’s grace to them? How would Jesus, the Good Samaritan, respond to them? (Luke 15:1-7 might be helpful here.) Ask God to help you love them as he has loved you. Mr Michael Willemse is the minister in the Hamilton Reformed Church.